The contents of this book of stories surprised me when I started to read, since my expectation was that the stories would be about the last letters that different soldiers sent home before their deaths on the battlefield. I have great interest in this topic since most Japanese kamikaze pilots wrote farewell letters to their family members after they knew that they would go on a suicide mission. The book's collection of previously published stories is a wide variety of remarkable accounts written by Josh Grossberg, a journalist with 30 years experience who originally had the stories published, mostly in the Daily Breeze newspaper in southern California. They all deal with American veterans in some way. The author allows individuals to tell their stories in their own words. 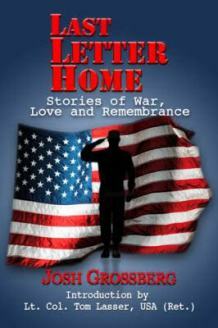 The title Last Letter Home comes from a five-page story included in the book. A Japanese soldier wrote a letter to his pregnant wife while fighting in the Marshall Islands. An American Marine, surrounded by corpses of 4,000 Japanese soldiers, found this letter in the dead soldier's shirt pocket. He took it and stored it away when he returned home. The letter remained unread for over 50 years, when he had a Japanese friend translate it so that he could find out about the letter's contents. Through clues in the letter, the veteran was able to locate the soldier's daughter and widow living in Matsuyama City and sent the letter to them. The American veteran's wife describes her feelings, "The emotions are overwhelming. It's like receiving a message from the past. He was thinking about her at the last moment and now she knows that." The stories in the book cover an assortment of wars and branches of service. A couple of stories relate to persons who serve as honor guard for military funerals performed for any veteran. Several stories come from veterans of the Normandy D-Day.